There’s a major highway closure as officers investigate a crash this morning. 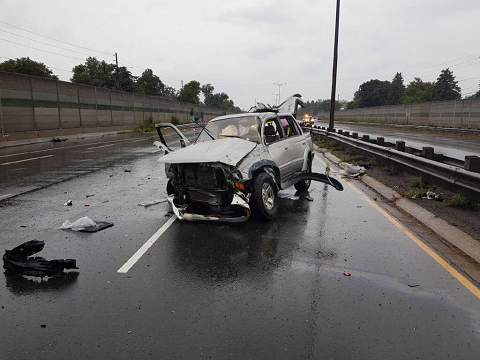 Police got a call at 4:00 a.m. for two vehicles involved in a collision on the QEW eastbound at Hurontario, according to OPP Sgt. Kerry Schmidt. “One of the vehicles punched right through the guide rail, causing significant damage,” Schmidt says. Several other vehicles were struck by debris and damaged as well. Police have arrested the driver of one of the vehicles, who was not accompanied by any passengers. 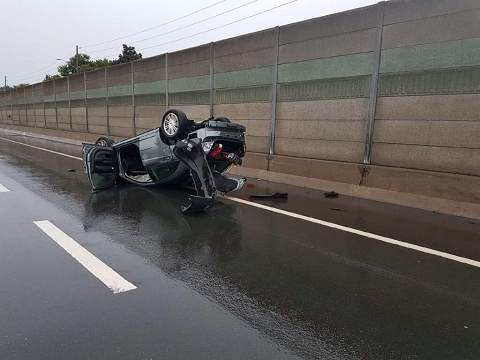 He is charged with impaired driving causing bodily harm and is currently in hospital with minor injuries. The other vehicle was carrying five people, who have all been hospitalized. Two were taken to a trauma centre in Toronto in critical but not life-threatening condition. The QEW is closed eastbound between Hurontario and Cawthra. One westbound lane remains closed as clean up continues. Closures are expected to last until 11:00 a.m., Schmidt reports. Drivers are asked to avoid the area and take other routes. The investigation is ongoing and police are seeking witnesses. Anyone with information regarding this incident is asked to call Port Credit OPP at 905-278-6131.